Sometimes you can’t help but be surprised at some musical statistics. Today’s band consists of a group of guys that are R&B and pop icons, but if you asked me to gauge their total success, I wouldn’t have put them at the top. They proved me wrong when I learned they are one of four acts of all time to hold the number one spot in the Billboard 100 for at least 50 weeks cumulatively. That puts them with Elvis, The Beatles and Mariah—good company. Nathan Morris and Marc Nelson started a group called Unique Attraction at the Philadelphia High School for Performing Arts in 1985. They’d cycle through various members, often using the high school bathrooms for tryouts and practices. A big influence for the group was the classic R&B group New Edition. Upon hearing their track “Boys to Men” in 1988, the new band name was born (with a few modifications such as replacing the ‘to’ with II). The group would sneak backstage of a New Edition concert to give them a quick tribute performance. Everyone in attendance was impressed, with member Michael Bivins calling them a few days later asking to become their manager. After a few delays due to personality conflicts and kicking the fifth member out of the band, and Boyz II Men became the quartet they’d stay for over a decade. 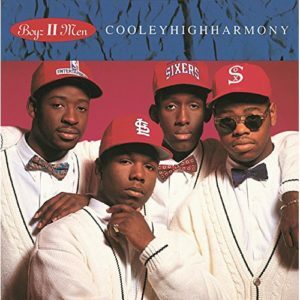 Today I’m listening to their very first release, Cooleyhighharmony which debuted in February of 1991. The album name is a tribute to a high school in Chicago, Cooley Vocational High School. The album did well upon release, with a couple tracks breaking the Top 5 on the Billboard 100—but it was 1992’s film “Boomerang” featuring Eddie Murphy that would catapult the band into the mainstream. The film featured a new track called “End of the Road” and the masses couldn’t get enough of it. It would be number one for thirteen weeks, shattering Elvis’s decades old record at the time. The label, Motown Records, decided to capitalize on the heat, and re-release the record in 1992 to include the smash single. Great decision, as the album has sold nearly 12 million albums worldwide. The huge successes forced the band to part ways with Bivins, and start to look for someone with more experience. A move that would end up putting Boyz II Men in virtually every medium possible over the next few years, working with artists from all genres. The dominance they had in the early to mid-‘90s was incredible. Being a young kid at the time, I can’t forget how often you’d hear these guys. To the point, at least for me, I got a little tired of them. However, going back to this 25 years later, it gives me a new respect for what they were doing. Now, the more than 25 million albums sold number makes sense. What they did from a vocal/harmony standpoint was so unique, and at a time when hip hop was incredibly controversial, these guys came out and made a group that couldn’t be more family friendly. There were elements of rap, but the pop collaborations they did with Mariah and such in the future is really what put them on the map. On their second album they’d even cover the historic track “Yesterday” by The Beatles as a tribute. It’s safe to say these guys were at the top of the world. The star faded pretty quickly in the late ‘90s and early 2000s. In 2003 their bass vocalist retired due to MS and back problems, but the band continues to tour today as a trio, even coming out with a new record in 2014. No question going back to the original material is the way to go however, especially when you can pick this up for a fiver. Give yourself a little Motown-Philly pick-me-up today, you won’t regret it. Saw them in concert last Thursday with New Kids on the Block…amazing group!